Miguel Elias Rojas Naidenoff...married to Mariana Rojas Gamboa; they have a son, Aaron Elias (11/28/15)...despite not watching his first American football game until 2016, won the 2016 Marlins' clubhouse fantasy football league along with co-owners Martín Prado and head athletic trainer Dustin Luepker. Set career highs for games (153), runs scored (44), hits (123), home runs (11), RBI (53) and steals (6)...Had exactly one home run in each of first four Major League seasons entering 2018...First Marlin playing primarily at shortstop to reach 10 home runs since Jose Reyes in 2012 (11)...Prior to 2018, season high for RBI was 26, done in 2017...Named 2018 "Mr. Marlin" award winner by South Florida BBWAA...Recorded first career walk-off hit on March 30 vs. Cubs (single); marked second career walk-off RBI (sac fly on August 26, 2017 vs. San Diego)...Had 10-game hitting streak from April 7-17, batting .350 (14x40) with a double, two home runs, and three RBI...Marked longest hitting streak of career within a single season, and tied for longest career hitting streak spanning multiple years (also, September 25, 2017 to April 1, 2018)... Had first career multi-HR game on May 20 at Atlanta. Despite spending most of first half on disabled list, bounced back to set new career highs in runs (37), hits (79), doubles (16), triples (2), RBI (26), and average (.290) as the Club's primary shortstop... Recipient of the "Good Guy" Award, as voted on by the South Florida chapter of BBWAA...Average ranked third on team, behind Marcell Ozuna (.312) and Dee Gordon (.308)...Had a hit in 52 of 75 starts, batting .288 (76x264)...Made 70 starts at shortstop, three at third base and two at second base...Posted .397 average (25x63) over final 20 games to raise season average from .258 to .290...Recorded career-high four RBI on September 25 at Colorado...Had eight-game hitting streak (.375/12x32) snapped on September 24 at Arizona; was tied for career best...Posted first career walk-off RBI with sac fly in 11th inning on August 26 vs. San Diego...On disabled list May 9 to July 18 due to right thumb fracture...Made 10 rehab appearances with Double-A Jacksonville (two games; .143/1x7) and Single-A Jupiter (eight games; .308/8x26). Had two hits on August 20 at Pittsburgh, giving him 42 for season, a new career high (previously 40 in 2015). Finished season with 48...Had first career stolen base on June 23 vs. Cubs...On June 26 vs. Cubs, became just seventh player in Club history to go 2x2 with 2 runs scored coming off the bench; first since Gaby Sanchez (4/16/10)...Had a hit in 15 of last 22 games started (.293/22x75), with seven doubles, a home run, and four RBI...Batted .262 (37x141) in 44 starts overall, with 10 doubles, a home run, and 13 RBI...Made first of 41 career appearances at 1B on April 5 vs. Detroit, and first of three starts there on July 24 vs. the Mets...Made no errors in 104.1 innings at first base, none in 170.2 innings at second base, and none in 43.0 innings at third base; made 4 errors in 208.2 innings at shortstop. Opened season with Triple-A New Orleans and batted .301 (75x249) in 65 games through June 26 before being recalled to Marlins for remainder of season...Led NOLA in hits at time of recall...Opened 2015 with .328 (20x61) average in April, followed by .347 (34x98) mark in May that earned him Marlins' Minor League Player of the Month award...Appeared in 60 games for Miami after recall, making Marlins' debut on June 27 vs. the Dodgers...Recorded career bests in hits (40), doubles (7), RBI (17), and average (.282)...Hit .354 (23x65) over last 20 games, with three doubles, a home run, and nine RBI...His average over that stretch (September 11-end of season) led Major League shortstops...In 24 games off the bench, batted .273 (6x22), with two doubles and four RBI...Had three-run pinch-hit double on August 5 vs. the Mets; first such hit by a Marlins' player since Brett Carroll on September 2, 2009 vs. Atlanta. Also tied his career single-game high with three RBI...Tied career-high with three hits on July 2 vs. San Francisco and Sept. 25 vs. Atlanta (also, Aug. 10, 2014 at Milwaukee)...Appeared in 18 games for Tiburones de La Guaira in Venezuelan Winter League following the season, batting .177 (11x62) with seven runs scored and five RBI. Had contract selected by Dodgers on June 6 and made Major League debut that night at Colorado as a defensive replacement at shortstop in the eighth inning...Made ?rst career start on June 8 at Colorado as third baseman...Flied out in ?rst career at-bat in second inning. Had ?rst career hit (single) and RBI in top of sixth inning; drove in last run of four-run rally that gave Dodgers 6-1 lead in a game that was called due to rain before bottom of sixth...Dodgers were 59-26 (.694) when Rojas appeared in a game...Had ?rst career multi-hit game on June 17 vs. Colorado (2x3), and recorded ?rst multi-RBI game next night, also vs. Rockies; knocked in three runs in that outing, marking a season high...Hit first career home run on July 9 at Detroit (Max Scherzer)...Opened season with Triple-A Albuquerque and hit .302 (48x159) in 51 games prior to selection to ML roster...After batting just .246 (15x61) over 21 games in April, rebounded by batting (33x98) over 30 games in May (27) and June (3), with 21 runs scored, four home runs and nine RBI...Was in midst of eight-game hitting streak at time of promotion, batting .412 (14x34). Scored at least one run in every game during that stretch (12 total), including three on June 2 vs. Salt Lake, and had four home runs and seven RBI...Hitting streak included ?ve straight multi-hit games from May 28-June 1, and six overall (all were two-hit games)...Hit home runs in consecutive games on May 28 & 29 (both at Sacramento) and June 2 & 3 (both vs. Salt Lake), marking ?rst back-to-back games with homers in career. Appeared in team-high 130 games for Double-A Chattanooga as the team's primary shortstop...At the plate, batted .233 (98-for-420) with five home runs and 32 RBI...Selected as the Dodger Pride Award winner for the month of July after posting a .280 batting average (25-for-75) with seven runs, 21 hits, three doubles and four RBI in 25 games...Recorded four consecutive multi-hit performances from July 27-30 and recorded his first four-hit game on July 14...Tied for second on the team in both triples (2) and walks (40). Signed by the Dodgers as a free agent on Nov. 13, 2012. Venezuelan Summer League in 2006. Originally signed as a non-drafted free agent on Nov. 24, 2005 by the Reds. November 20, 2018 SS Miguel Rojas assigned to Tiburones de La Guaira. July 18, 2017 Miami Marlins activated SS Miguel Rojas from the 60-day injured list. July 13, 2017 Miami Marlins sent 3B Miguel Rojas on a rehab assignment to Jupiter Hammerheads. July 11, 2017 Miami Marlins sent 3B Miguel Rojas on a rehab assignment to Jacksonville Jumbo Shrimp. July 8, 2017 Miami Marlins sent 3B Miguel Rojas on a rehab assignment to Jupiter Hammerheads. May 9, 2017 Miami Marlins placed 3B Miguel Rojas on the 60-day disabled list retroactive to May 8, 2017. Right thumb fracture. October 28, 2016 2B Miguel Rojas assigned to Tiburones de La Guaira. October 13, 2015 3B Miguel Rojas assigned to Tiburones de La Guaira. June 27, 2015 Miami Marlins recalled 3B Miguel Rojas from New Orleans Zephyrs. 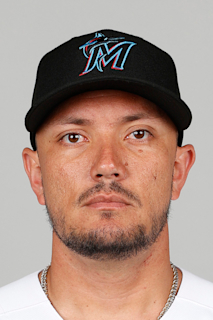 March 18, 2015 Miami Marlins optioned SS Miguel Rojas to New Orleans Zephyrs. December 11, 2014 Los Angeles Dodgers traded 2B Dee Gordon, RHP Dan Haren, SS Miguel Rojas and cash to Miami Marlins for LHP Andrew Heaney, RHP Chris Hatcher, 2B Enrique Hernandez and C Austin Barnes. October 9, 2014 SS Miguel Rojas assigned to Tiburones de La Guaira. September 2, 2014 Los Angeles Dodgers recalled SS Miguel Rojas from Albuquerque Isotopes. August 31, 2014 Los Angeles Dodgers optioned SS Miguel Rojas to Albuquerque Isotopes. June 6, 2014 Los Angeles Dodgers selected the contract of Miguel Rojas from Albuquerque Isotopes. April 1, 2014 SS Miguel Rojas assigned to Albuquerque Isotopes from Chattanooga Lookouts. February 6, 2014 Los Angeles Dodgers invited non-roster SS Miguel Rojas to spring training. October 10, 2013 SS Miguel Rojas assigned to Tiburones de La Guaira. March 31, 2013 SS Miguel Rojas assigned to Chattanooga Lookouts. January 8, 2013 SS Miguel Rojas assigned to Toros del Este. November 13, 2012 Los Angeles Dodgers signed free agent SS Miguel Rojas to a minor league contract. November 2, 2012 SS Miguel Rojas elected free agency. October 11, 2012 SS Miguel Rojas assigned to Tiburones de La Guaira. September 1, 2012 SS Miguel Rojas assigned to Louisville Bats from Pensacola Blue Wahoos. June 26, 2012 Miguel Rojas assigned to Pensacola Blue Wahoos from Louisville Bats. May 13, 2012 Miguel Rojas assigned to Louisville Bats from Pensacola Blue Wahoos. May 10, 2012 Miguel Rojas assigned to Pensacola Blue Wahoos from Louisville Bats. April 30, 2012 Miguel Rojas assigned to Louisville Bats from Pensacola Blue Wahoos. March 9, 2012 SS Miguel Rojas assigned to Cincinnati Reds. August 11, 2011 Carolina Mudcats activated SS Miguel Rojas from the 7-day disabled list. August 3, 2011 sent SS Miguel Rojas on a rehab assignment to AZL Reds. June 29, 2011 Carolina Mudcats placed SS Miguel Rojas on the 7-day disabled list. Right shoulder injury. June 24, 2011 Carolina Mudcats activated SS Miguel Rojas from the 7-day disabled list. April 17, 2011 Carolina Mudcats activated SS Miguel Rojas from the 7-day disabled list. March 1, 2011 SS Miguel Rojas assigned to Cincinnati Reds. August 31, 2010 SS Miguel Rojas assigned to Carolina Mudcats from Lynchburg Hillcats. August 26, 2010 Miguel Rojas assigned to Lynchburg Hillcats from Carolina Mudcats. August 24, 2010 Miguel Rojas assigned to Carolina Mudcats from Lynchburg Hillcats. August 17, 2010 Miguel Rojas roster status changed by Lynchburg Hillcats. August 15, 2010 sent SS Miguel Rojas on a rehab assignment to AZL Reds. June 25, 2010 Lynchburg Hillcats placed SS Miguel Rojas on the 7-day disabled list. April 5, 2010 SS Miguel Rojas assigned to Lynchburg Hillcats from Dayton Dragons. March 17, 2010 SS Miguel Rojas assigned to Cincinnati Reds. October 8, 2009 SS Miguel Rojas assigned to Tiburones de La Guaira.